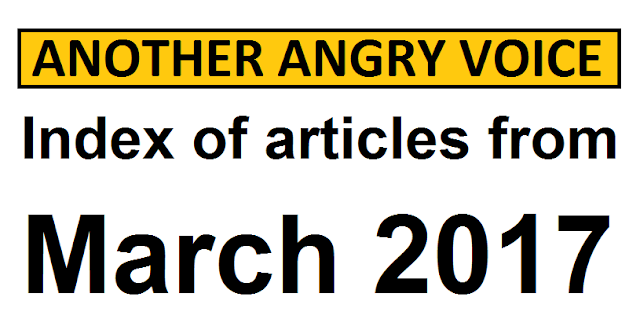 In March 2017 I wrote 41 Another Angry Voice articles (not including this index article) and created quite a few infographics and quote pictures for Facebook too. If you appreciate my work and would like to help me to keep writing and making infographics please consider setting up a small monthly donation (preferred) or making a single one off donation (still gratefully appreciated). Creating this index of articles has helped me get a picture of how much my coverage was dominated by Brexit this month (not much of a surprise given that march 2017 was the month that Article 50 was finally triggered). 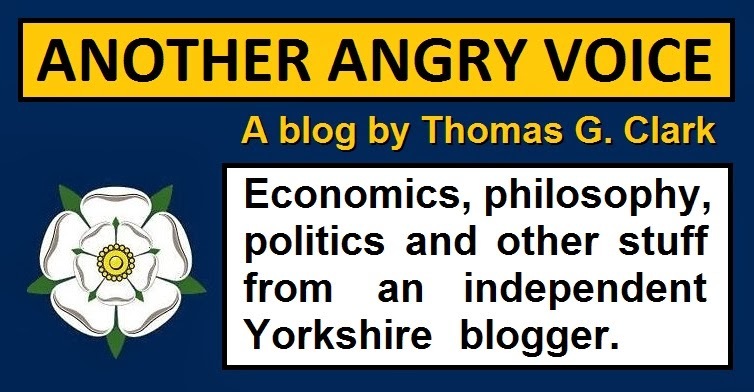 In April 2017 I'll try to cover a wider range of subjects, perhaps by doing a few new articles for the Political Myth Busting and What is ... ? series. Huge thanks to all the people who made Pay As You Feel donations, and to people who helped to spread awareness of my work with all the likes. shares and comments on Facebook and Twitter Retweets. Has Theresa May set us on an irreversible course towards a "no deal" Brexit cliff edge? After six moths of dithering and repeatedly fobbing the electorate off with meaningless platitudes like "Brexit means Brexit" Theresa May finally announced her so-called "negotiating strategy" in her January 2017 clown costume speech. The right-wing press reacted to her woeful speech as if it was Churchillian in its magnificence, but to anyone with the wit to consider her words for themselves (rather than mindlessly allowing the mainstream media to programme their opinions for them) couldn't help but notice a couple of glaring flaws in it. The first flaw was that much of what Theresa May was promising was spectacularly unlikely to happen. Special sectoral deals to allow Single Market access just for favoured sections of the economy like banking and car manufacturing (while locking small businesses, sole traders and individuals out of it) are not only a terrible idea that would rig the UK economy even more in favour of massive multinational corporations, but also a ridiculous fantasy that the EU were never going to allow to happen. The second thing was that her long awaited "negotiating strategy" was nothing more than threat-based posturing. If the EU don't cave in and give Theresa May the special corporate favours she's demanding she's threatening to strop away from the negotiating table with nothing, and then use that as an excuse to set about turning the UK into a parasitical and universally despised corporate tax haven. Ever since this diplomatic toddler tantrum of a "negotiating strategy" was announced, it's been reinforced over and again by the endless repetition of the propaganda sound bite that "no deal is better than a bad deal". The draft EU resolution on Brexit negotiations makes it absolutely clear that Theresa May's fantasy of some kind of quickfire partial free trade agreement is in tatters. There's no way she's getting special sectoral deals for her corporate mates, there's no way that she's even going to be allowed to start negotiating an EU-UK trade deal before the Brexit divorce agreement is finalised, and there's no way that she's going to be allowed to start making the Trump-Tory trade deal she's been begging for before the UK has actually left the EU. Theresa May has promised the nation a load of stuff that she absolutely won't be able to deliver. The Brexit fantasy that Theresa May has been hawking to the public is completely at odds with reality. This means that she's going to have to walk back on a lot of the stuff she's been saying, and offer numerous concessions to the EU in order to get any kind of deal whatever. The problem of course is that she's primed the right-wing press and her own Eurosceptic MPs with the propaganda sound bite that "no deal is better than a bad deal" meaning that they will obviously use every single concession she makes as an excuse to shriek "bad deal" at her and demand the socially and economically ruinous nuclear Brexit they've always craved. Is Theresa May a strong enough leader to withstand such a relentless onslaught, or is she the kind of weak leader who sees pandering to hacks at the Daily Mail, S*n and Express as one of her core objectives? The Brexit minister David Davis has openly admitted that the Tory government did absolutely no risk analysis on how bad a "no deal" nuclear Brexit would be before they decided to use the threat of it as the centrepiece of their so-called "negotiating strategy". The London School of Economics has done some analysis on the "no deal" scenario and their findings are horrifying. They have estimated that if the UK strops away from the negotiating table with no deal, it will cost the UK somewhere between 6.3% - 9.5% of GDP (that's an average of £4,200 - £6,400 per household). If Theresa May caves in to the "bad deal" shrieking of the Tory Eurosceptics and the hard-right press and flounces away from the negotiating table empty handed, the economic consequences will be catastrophic (especially for the manufacturing sector). The warnings of economic ruination won't stop the baying Brexiter enforced optimism mob from insulting and belittling anyone who tries to raise concerns though. Is this what she actually wanted? The most charitable interpretation of Theresa May's "no deal is better than a bad deal" rhetoric is that it's a catastrophically inept failure in expectation management. But then there's also the distinct possibility that it's part of a deliberate ploy to condition the public into actually believing that driving the UK economy off an economic cliff edge is the best course of action by presenting any alternative to marching off the cliff as a "bad deal"! The quickfire pro-corporate EU-UK trade deal that Theresa May outlined in January is pure fantasy that was never going to happen, so threatening to march the UK economy off a cliff if she didn't get it was an incredibly dangerous threat to make. The big question of course is whether Theresa May decided to make such ridiculously unrealistic demands because she's totally delusional, or if she knew it was impossible nonsense all along but that it's part of a Tory ploy to deliberately walk away from the negotiations empty handed so they can turn the UK into a deregulated corporate tax haven whilst pinning all of the blame for the ensuing social and economic catastrophe on the EU. As is so often the case we're left considering the age old question: Is this latest Tory shambles down to incompetence, or is it down to malice? In May 2016 the disgraced former Tory MP Neil "cash for questions" Hamilton was handed a lifeline back into politics by the 25,042 people in the Mid and West Wales region who voted UKIP in the Welsh Assembly elections. In March 2017 the bigoted ex-Tory made it absolutely clear why his political resurrection was such an embarrassment to Wales by remarking that "suicide's an option" as the Labour Assembly Member Eluned Morgan was explaining that the economic consequences of Brexit would be hardest for those who could least afford it. After his suicide remark a wave of disquiet rippled through the chamber until the Presiding Officer Elin Jones intervened to give Hamilton the opportunity to apologise. Hamilton belligerently refused to admit that he'd said anything unacceptable by asking "What is there to apologise for?" and "What was unparliamentary about the remark?". In 2015 the number of suicides in England and Wales increased to its highest level in 20 years. 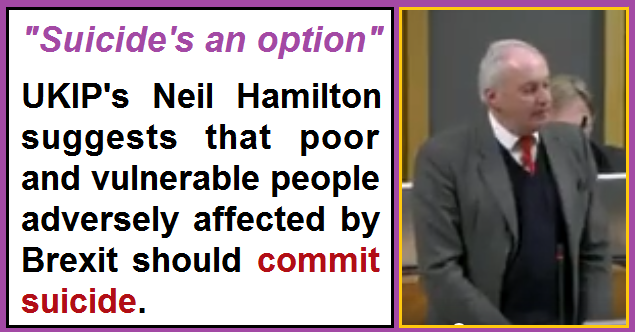 Whether Hamilton was being serious that people who are thrown into poverty by Brexit should kill themselves, or he was making some kind of sick joke, his remarks were completely unacceptable. The people of the Mid and West Wales region who voted this corrupt ex-Tory back into politics deserve a slow hand clap for giving this appalling individual the chance to spew offensive and bigoted nonsense in their national parliament. I guess most of them won't care though. They'll have an excuse for it, or they'll outright deny reality by saying it didn't happen, just like all the 'Kippers a few days previously who had no problem with Nigel Farage saying that if Brexit turns out to be a social and economic catastrophe he'll go and live abroad rather than apologise to the nation. One of the main non-immigration related arguments that Brexiters used before the referendum was the complaint that the EU is supposedly undemocratic, but within the space of a year this faux concern about democracy has been proven false time and again. The first thing to point out is that the "undemocratic EU" argument was always incredibly hypocritical coming from a country with the largest unelected legislative chamber in the entire world, an unelected head of state, a profoundly undemocratic (and hopelessly discredited) honours system, an undemocratic central bank, and a hopelessly outdated profoundly unrepresentative voting system. Of course the EU has democratic deficits (an undemocratic central bank like the UK, loads of appointed political figures that pretty much nobody has ever heard of, contempt for participatory democracy ...) but it's clearly way more democratic that the anachronistic shambles in Westminster. Immediately after Brexit the gaping hypocrisy of the "undemocratic EU" argument was revealed when the Tory party appointed Theresa May as their leader, and as Prime Minister of the UK by default, by pressurising her opponent to quit the leadership contest before it could even be put to a vote of Tory party members. The Tories are clearly so afraid of democracy they don't even allow their own party members to have a say on who their leader is! Another glaring display of contempt for democracy came when Brexiters howled with outrage after three High Court judges ruled that parliament is sovereign and that Theresa May couldn't just make up laws as she goes along like a dictator would. "Enemies of the People" shrieked the Brexiters at the judges who had dared to rule that parliamentary democracy is sovereign, not our unelected Prime Minister. 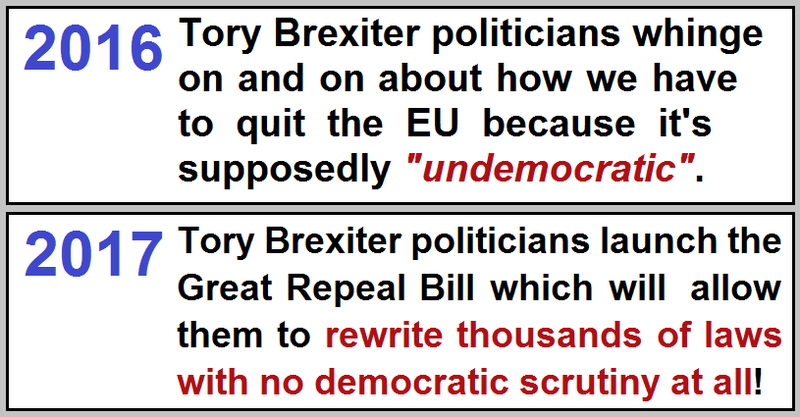 On the day after Theresa May submitted her appalling Article 50 letter the Tories launched an astonishing assault on the concept of parliamentary democracy called "The Great Repeal Act" which is designed to allow Tory ministers to rewrite thousands of UK laws with absolutely no democratic scrutiny whatever. Of course the Brexiters who claimed to care so strongly and so deeply about democracy last year when they had a referendum to win are now completely silent about this latest astounding anti-democratic power grab by the Tory party. The Brexit minister David Davis' response to criticism that the Great Repeal Act is an anti-democratic power grab is to pretend that him and his Tory colleagues are completely trustworthy. 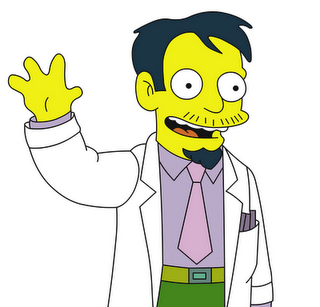 Considering that over a dozen files about the 2015 Tory Election Fraud have been handed to the Crown Prosecution Service, Davis' reassurances that the Tories can be trusted to rewrite our laws without democratic scrutiny are about as convincing as Dr Nick Riviera off the Simpsons saying "trust me, I know what I'm doing". The contempt for democracy in Britain is rampant. When David Cameron resigned he showered his friends in undemocratic honours and peerages in the unelected House of Lords; his successor Theresa May evaded even being democratically elected as leader of her own party; the right-wing press savagely abused the judges that ruled in favour of parliamentary democracy; the unelected Prime Minister is currently swearing to obstruct the democratic mandate of the Scottish Parliament, and the Tory government have just launched an astonishing anti-democratic power grab. Despite chuntering on and on about the EU being undemocratic in order to win the referendum, the reality is that huge numbers of Brexiters (including Tory Brexiter politicians) clearly don't give the faintest damn about democracy. In fact they actively oppose democracy by slagging off pro-democracy judges and they're silent as the Tory government introduce astoundingly anti-democratic legislation to bypass parliament completely and allow Tory ministers to rewrite the laws of the land as it suits them. The EU's draft resolution on Brexit negotiations delivers several massive hammer blows to Theresa May's fantasy of a quickfire EU-UK partial free trade deal. When Theresa May outlined her "negotiating tactics" in her January 2017 clown costume speech the hard-right press pack responded with glee at her diplomatically inept threat-based posturing, but anyone with a few brain cells to rub together realised with horror that she was slow-marching the UK towards a catastrophic "no deal" strop. 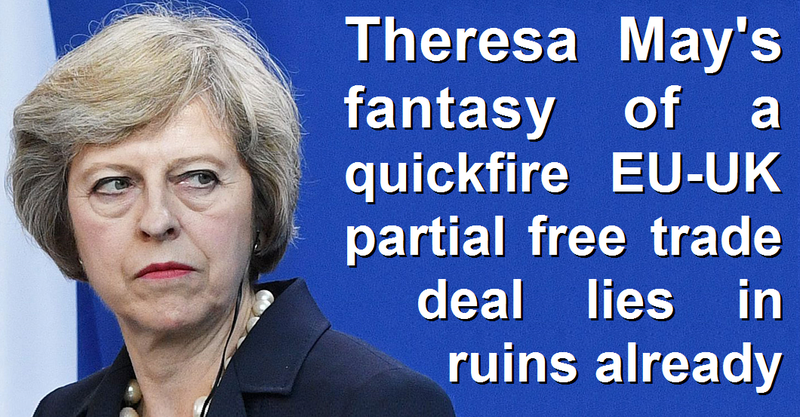 What she did was outline an ridiculously impossible fantasy of what she expects from the EU and then threatened that if she doesn't get it she'll take the nuclear option of stropping away from the negotiating table with no deal whatever. For ordinary people this negotiating stance was always going to be a lose-lose situation. Even if by some miracle the EU caved into Theresa May's ridiculous demands we would be stuck with a situation where major corporate sectors (finance and vehicle manufacturing were mentioned by name) get to retain access to the Single Market, while small businesses, sole traders and individual citizens are locked out of it and hit with import and export tariffs. This would leave the UK economy even more rigged in favour of gigantic multinational corporations than it already is. Given the fantastical nature of Theresa May's demands the more likely option was always going to be a socially and economically ruinous nuclear Brexit. The London School of Economics has estimated that a retaliatory nuclear Brexit would cost the UK somewhere between 6.3% to 9.5% of GDP, which equates to (£4,200 - £6,400 per household). Anyone who thinks that sounds like an attractive option is clearly bonkers. In this section I'm going to outline just five of the most significant hammer blows to Theresa May's wildly over-optimistic fantasy of a quickfire partial free-trade deal with the EU. These are five of the most serious issues, but there are plenty more too. If you want to see more take a look at the draft EU resolution here. In her Article 50 letter Theresa May begged repeatedly for parallel negotiations so that the UK's divorce terms and post-divorce trade deal can be negotiated in unison. The draft resolution shoots this wish down in flames. The EU have made it absolutely clear that Theresa May won't be getting any kind of quickfire trade deal before the UK has officially quit the EU. The best they're willing to offer is a three year transitional arrangement so the post-divorce trade deal can be negotiated under relatively stable conditions. The EU's lead negotiator Michel Barnier has stated that any post-Brexit trade deal would be classified as a "mixed agreement". This is highly significant because it means that aside from requiring ratification at the European Parliament, the trade deal would also need to be ratified by the national parliaments of all 27 other member states. Essentially every other country in Europe is going to have a national veto over any EU-UK trade deal, plus, due to the special ratification procedures in Belgium, several of their regional parliaments like Wallonia will also get a veto too. You'd have to be spectacularly optimistic to think that the likes of Theresa May, David Davis, the disgraced Liam Fox and Boris Johnson would be able to cobble together an agreement that is both acceptable to all of the 27 remaining EU states, and also to the hard-right tabloid propaganda rags that are looking for any excuse whatever to screech for a socially and economically ruinous "no deal" nuclear Brexit. One of Theresa May's big demands from her clown costume speech was that certain sectors of the UK economy (she mentioned banking and vehicle manufacturing specifically) should be given preferential access to the Single Market. This fantasy lies in ruins now because the EU have clearly stated that there will be "no sectoral deals" that replicate the benefits of being in the Single Market only for certain sectors of the economy. The EU have made it absolutely clear that they don't intend to allow Theresa May to cherry-pick special access to the Single Market for favoured corporations (those with the financial power to bribe or coerce the Tory party into representing their interests). Either everyone gets fair access or nobody does. In her clown costume speech Theresa May naively pinned her hopes on getting a quickfire trade deal with the United States and then soon after she went scuttling off to lick Donald Trump's boots and plead for a special US-UK trade deal in the national humiliation that was her "begging bowl" speech. The problem here is that the EU have made it explicitly clear that if she tries to jump the gun by negotiating trade deals with other countries before the divorce settlement is finalised, the EU-UK deal is off the table. "Should Britain seek to negotiate any free trade deals with other countries while it is still an EU member state, there will be no future discussion of a deal with the union." If Theresa May tries to jump the gun by negotiating trade deals with other countries (such as the United States) before we've fully left the EU then she'll be completely trashing the possibility of any kind of trade deal with the EU (which accounts for well over 50% of the UK's trade in goods). The stipulation that neither side should try to use the withdrawal of security and defence cooperation as blackmail is eerily prescient. It just goes to show how Theresa May is perceived on the continent that the EU would bother to add a clause to prevent her from using the threat of turning a blind eye to terrorism plots as a bargaining chip in the trade negotiations. To have explicitly ruled out such sickening blackmail tactics they obviously see her as a fanatical and dangerous hard-right extremist who would use literally any kind of threat, no matter how depraved, in order to get her own way. Astonishingly Theresa May managed to live down to the EU's worst expectations by including the threatened withdrawal of security cooperation in her Article 50 letter. The right-wing press reacted gleefully to Theresa May's disgusting blackmail tactics, but any Brit with a shred of human decency must surely be horrified that Theresa May is actually threatening to turn a blind eye to terrorism in order to blackmail the EU into caving into her fantastical demands. Did Theresa May want a "no deal" nuclear Brexit all along? The sheer incompatibility of Theresa May's fantastical expectations and what the EU have outlined in their draft resolution makes her threat of launching a mutually destructive nuclear Brexit look almost inevitable. The Tories and the hard-right press have been indoctrinating the public for months with their "no deal is better than a bad deal" rhetoric, but this has left Theresa May no room for manoeuvre whatever. Any concession she makes to the EU will be leapt upon by the hard-Brexiters and the right-wing press as proof that Britain is getting a "bad deal" so that they can demand their favoured "no deal" scenario. 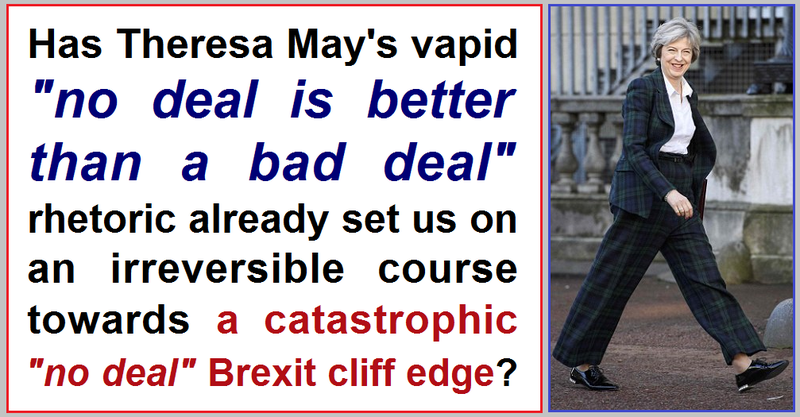 At the absolute best Theresa May's "no deal is better than a bad deal" rhetoric is a catastrophic failure in expectation management, but it actually seems more likely that it's a deliberate ploy to condition the public into actually believing that driving the UK economy off an economic cliff edge is the best course of action! The quickfire cherry-picking Brexit deal that Theresa May outlined in January is never going to happen. It always was a ludicrous fantasy. The big question of course is whether Theresa May outlined such a ridiculous fantasy because she's totally delusional, or because she knew it was impossible nonsense all along and saw the making of such ludicrously unrealistic demands as part of a Tory ploy to walk away from the negotiations empty handed while pinning the blame for the ensuing social and economic catastrophe on the EU. 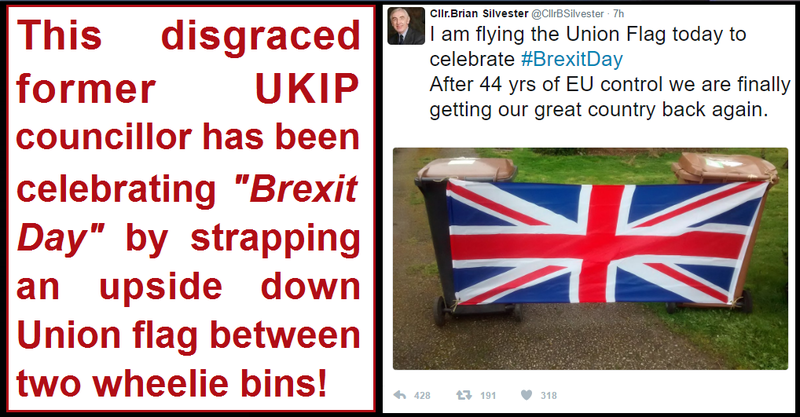 The UKIP former councillor Brian Silvester is a nasty piece of work, and a pseudo-patriotic fool who doesn't know what he's doing to boot. Silvester was forced out of the Tory party in 2012 for being a slum landlord. He was fined £45,000 at Chester Crown Court for serious fire safety breeches at a multiple occupancy building. This scandal meant that his position in the Conservative group on Cheshire East Council became totally untenable. We all know where the natural home for disgraced former Tories is, and Silvester was soon welcomed with open arms by UKIP. In 2014 Silvester was investigated for using his council email address to try to set up a land deal to build houses on greenfield land he owned. Not only an obvious breach of public standards but also a grotesque display of hypocrisy too, given that he actually campaigned against greenbelt development! UKIP saw nothing wrong with his outrageously hypocritical behaviour and let him stay in their party, but in 2015 he lost his council seat at the local elections. Since losing his seat Silvester has been chuntering away on Twitter. Back in November he provoked a storm of criticism for trying to incite mobs of Brexiters to intimidate judges by protesting outside their houses. On the day that Theresa May triggered Article 50 silvester decided to celebrate "Brexit Day" by displaying the Union flag and posting a picture of it to Twitter, but he found just about the most disrespectful way of displaying the flag imaginable; upside-down and strapped between two wheelie bins! 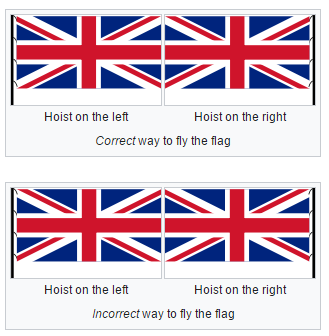 You don't have to be an expert to see that the flag is upside down. 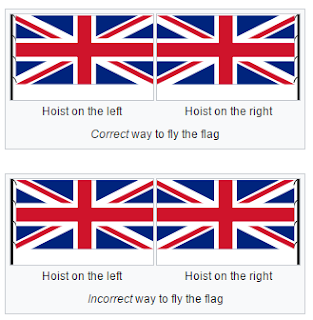 When the hoist is on the right as Silvester has arranged it, then the white St Andrew's Saltire should be above the red of the St Patrick's saltire in the upper quadrant closest to the flagpole. Tradition also dictates that when the flag is displayed statically (rather than on a flagpole), the hoist should be to the left, so not only has Silvester got the flag upside down, he's got it the wrong way around too! Displaying a flag upside down is considered a grave insult to the country, region or city in question, but tradition doesn't record whether strapping a flag to a pair of bins is also an insult. I guess that if any vexillologist had ever imagined anyone attaching flags to bins, they probably would have concluded that it probably shouldn't be considered standard practice. 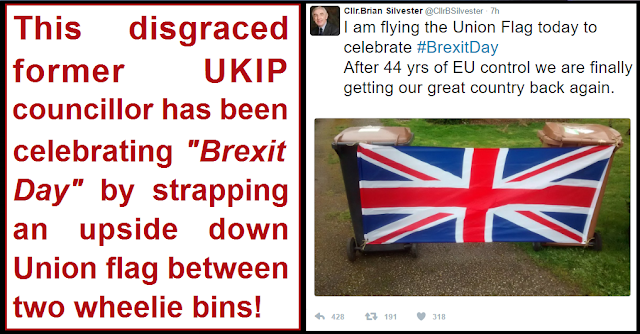 In a way Silvester's wheelie bin tribute is a perfect metaphor for Brexit: An ugly pseudo-patriotic mess cobbled together by an out-of-touch right-winger who clearly doesn't have a clue what they're doing. Is "will of the people" an actual thing or just another empty Brexiter slogan? ... but if "will of the people" is an actual thing rather than just another empty Brexiter slogan (like "£350 million for the NHS", or "taking back control"), Brexiters have got no right to drag Scotland along on their economic suicide mission. Scotland voted 62% to 38% to stay in the European Union; the Scottish parliament has established a clear democratic mandate for another independence referendum; and the Scottish electorate are certainly not enamoured with Theresa May's absurd lose-lose negotiating stance where the choice is between an outrageously pro-corporate Tory Brexit deal or the social and economic catastrophe that would result from Theresa May flouncing off in a "no deal" strop because the EU decide to call her bluff on her ludicrously hubristic threats. If you have any respect for the "will of the people", or you have any respect for the democratic mandate of the Scottish parliament it's obviously only right that the Scots get the right to decide if they want to go along with Theresa May's Brexit shambles, or whether they want to make a go of it as an independent nation. 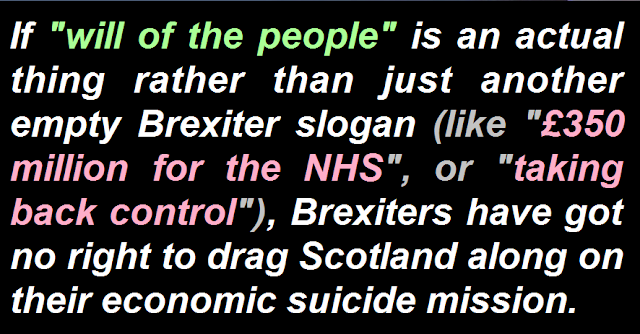 Only the most hypocritical of Brexiters could believe that it's right to ignore the will of the Scottish people (and the democratic mandate of the Scottish parliament) in order to drag them out of the EU against their will because the will of the English people supposedly takes precedence.